We are eager to meet our clients’ expectations and are happy to make special arrangements to ensure all our catering services are of the highest standard. We will do our utmost to meet our commitment to our clients and will do everything we can to accommodate reasonable requests and will act on any problems or suggestions. All basic food preparation and cooking will take place in our production kitchen in Bruton. Some menus/dishes may need to be finished at the client’s venue for an event. Appropriate refrigeration space and clean, clear work surfaces are required for all food preparation. Appropriate and fit for purpose refrigeration, cooking facilities and food heating equipment are required to meet Food Safety and Health and Safety Standards. Extra refrigeration may need to be hired on your behalf to meet this requirement but this will be agreed in advance, if required. 3. Drop off meals: Fully prepared meals which our client finishes and serves. We are flexible and happy to re-quote to remain within the budget of any event. • Supervision, serving the meal and co-ordination the event e.g. The quoted price does not include catering equipment, crockery, cutlery and glassware, napery, linen or its delivery or staff. Breakages and costs from Hire Companies are passed onto our client. Clearing up after the event may require a fresh team of workers or longer working hours for service staff. Please note that during Christmas, Boxing Day, New Years’ Eve and New Years’ Day and Easter and Bank Holidays, staff will be charged at double the hourly rate relevant to the work being rendered. The menu is charged as quoted per person. Any extras such as the hire of goods, goods procured on your behalf or extra staff hours will be for your account. Set up will generally be charged at the rates of the service teams of Waiters, Front of House and Supervisors indicated below. Staff numbers will be agreed with our client and will be confirmed in our quotation to you. We only charge for the actual amount of hours worked and this may be more than estimated in our quotation to you. Where work locations are more than 10 kms from our kitchen or the home of a contact worker (working at our clients location), travel time will be charged. Where staff work longer than 6 hours we will ask your permission for staff, after service, to partake of food being served, if any available. On pre-arranged agreement with clients, we would like to be able to offer staff a soft drink while on duty if this is available. VAT will be charged at the standard rate of 20% and is zero rated on Frozen Food. Parking fees, including parking fees of waiting staff – all direct costs for clients account. Waiters generally share transport. A small fee to cover fuel for waiters’ transport may be applicable in some cases but this will generally be discussed before the event takes place. If our presentation platters are used to take food home after an event, the cost of the platters will be recovered from clients. Costs start from £20 per platter and handmade items considerably more. If platters are however returned in good condition this will be refunded. We will generally confirm our catering services to you in writing well in advance of the event. Kindly confirm arrangements, to avoid any misinterpretation regarding dates, times and numbers and any food allergies which may need to be catered for. Your confirmation serves to indicate that you have agreed to our terms and conditions. Food allergies and special meals should be notified to us at least a week before the event please. An 85 % deposit is requested upon confirmation of catering services which will be deducted from the final account. Accounts are payable upon presentation please and electronic transfer are preferred but cheques are welcome. All details are in the footer of our invoice. Fees and prices are subject to change but where circumstances permit this will be discussed with our clients before the time. A downward change in numbers, exceeding 10% of the initial order, not notified within 10 days of commencement of the function, will be charged in full. Confirmation of final numbers for functions of 50 guests, must be confirmed 14 days before the event. Please inform us of an increase in number of guests as soon as possible and we will do our utmost to accommodate the change. If no personal home base is available to staff, clients are requested to make reasonable accommodation and meal arrangements available please. The minimum daily rate is based on eight working hours a day. If eight hours are exceeded then this will be charged over and above the daily rate. Travel time is based on an eight hour day, and travel is charged at a full days’ rate before the event and a day to travel back home at the end of the event, plus travelling expenses e.g, car hire or flight, fuel costs, alternately mileage – as agreed with client. Our staff are not permitted to take photographs of your event while in service. We reserve the right to photograph the food we produce and table settings created during an event, for use on a website/social media platform but this will not identify the event, nor the guests. If our catering equipment or goods are wilfully or negligently damaged or stolen at an event the replacement cost is payable by the client. If a client’s property is wilfully or negligently damaged by ourselves we will pay the replacement cost to the client if the item cannot be settled through the client’s insurance. We do not accept responsibility for the loss of personal property of our clients or their guests during an event. Where more than one caterer provides food for an event we cannot accept liability for any food safety issues which may arise. Our public liability cover only extends to £5 million and Employers liability to £10 million for any one occurrence. This only relates to the provision of food. We will not be liable for any other event related claim. We shall be under no liability for any delay or failure to provide the service as a result of any act or circumstance beyond our reasonable control including but not limited to the Act of God, legislation, war, fire, draught, failure of power supply, lock – out or strike. We are flexible about our services. Please feel free to contact us for further assistance or to answer any queries you may have. This Website is owned and operated by Majesty7 Ltd trading as Eat West Country (‘we’/’us’/’our’), a limited company (trading as Eat West Country), registered in England and Wales under company number: 8281960 having our registered office at 145-157 St John’s St, London EC1V 4PW, UK. Our business address is Eat West Country, C/o Godminster Farm, Bruton, Somerset BA10 0NE. You agree that if we contact you to acknowledge receipt of your order such communication shall not amount to our acceptance of your offer to purchase the Products ordered by you from the Website. A contract between you and us (the ‘Contract’) incorporating these Conditions will only subsist after we have debited your payment card and have confirmed that we have dispatched the goods and/or shall be providing the requested service and, where appropriate, have made it available to be downloaded. We will send you an email to confirm this (a ‘Confirmation Notice’). The Confirmation Notice will amount to an acceptance of your offer to buy the Products from us. The Contract will only be formed when we send you the Confirmation Notice (whether or not you receive it). If a delivery has failed as a result of circumstances beyond our or our carrier’s control, we shall attempt to call you and put alternate delivery times in place. You may cancel your order for the Products at any time prior to or after receiving a Confirmation Notice from us so long as you contact us in writing. You can send us a cancellation notice by sending an email to kitchen@eatwestcountry.co.uk. If you are not online and your order was placed by telephone in the first place, you can phone us on 01749 938105. Your cancellation notice must quote your name, address, the name or a description of the Products and your order reference number. Please note clause 13.2. You may cancel your services order at any time prior to or after receiving a Confirmation Notice from us so long as you contact us in writing at least 2 days before the expected time of delivery, stated on our confirmation notice. You can send us a cancellation notice by sending an email to kitchen@eatwestcountry.co.uk. If you are not online and your order was placed by telephone in the first place, you can phone us on 01749 938105. Your cancellation notice must quote your name, address, the name or a description of the Seasonal Meals and your order reference number. 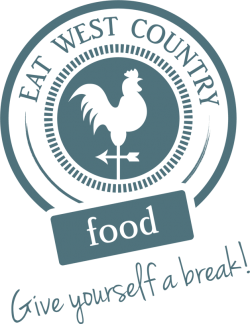 If you have a comment, concern or suggestion about any Products you have purchased from us, please contact us via email atkitchen@eatwestcountry.co.uk or by post at Eat West Country, C/o Godminster Farm, Bruton, Somerset BA10 0NE. If you have a complaint about our products or delivery service, please contact us either by email onkitchen@eatwestcountry.co.uk, or letter to Eat West Country, Godminster Farm, Bruton, BA10 0NE or by calling 01749 938105. We will do our utmost to correct any anomaly and we will happily refund or replace any products you feel did not meet our usual standards. registered in England and Wales under company number: 8281960 having our registered office at 145-157 St John’s St, London EC1V 4PW, UK. Our business address is Eat West Country, C/o Godminster Farm, Bruton, Somerset BA10 0NE.